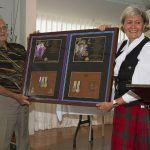 The Mackay & District Pipe Band’s year commences with a Burns Supper at the North Mackay Bowls Club on January 19, 2019. The next event is the St Patrick’s Day Céilí for our Irish friends in mid-March. ANZAC Day is the busiest day of the Band’s year. 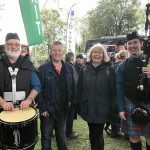 Mackay & District Pipe Band will play at the Dawn Service in Mackay, provide a mini-band for Dawn Services at Marian and Kuttabul and solo pipers at Greenhill, Farleigh, and Seaforth. 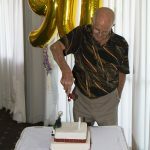 The band will then march at full strength in the Mackay Main Parade before attending other parades and services throughout the day at Calen, Mirani, and Finch Hatton. 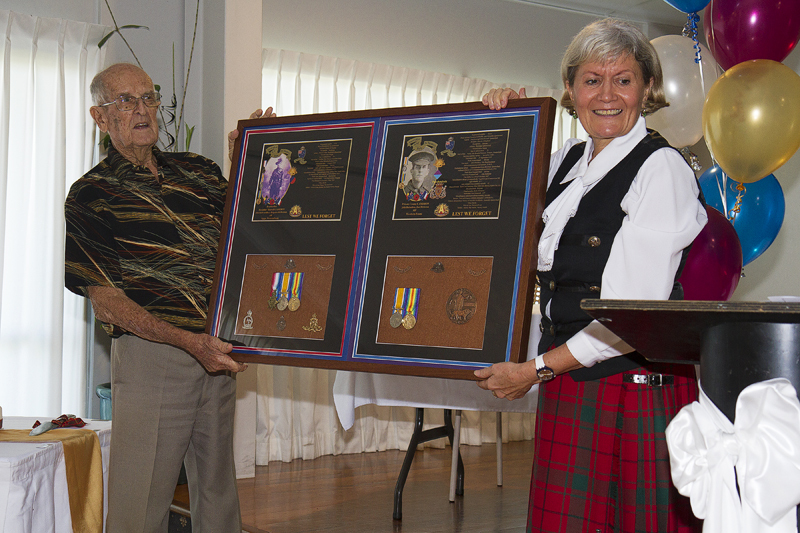 In mid-June, the Band travels north to Townsville to play at the Townsville Tartan Day with our friends from the RSL Memorial Pipes & Drums, the Townsville-Thuringowa Pipe Band, and the Townsville Scottish Community. In October, the Band plays at Mackay’s multi-cultural Global Grooves event in Queens Park. The last event of the Band’s year is the St Andrew’s Day Ceilidh at the North Mackay Bowls Club at the end of November. International Dance Affair is renowned for its variety of dance genres and fantastic story-lines which feature in their annual dance concerts. This year is no exception with such dance genres as Ballet, Tap, Jazz, Highland, Baton Twirling, Hip Hop and Irish Dancing. Like to book the Band? If you would like to book a Piper, mini-Band or Full Band for your special occasion, please Contact Us and a band member will respond to you shortly. Congratulations to Aaron Gray on his win at the ACT Solos held in Canberra. 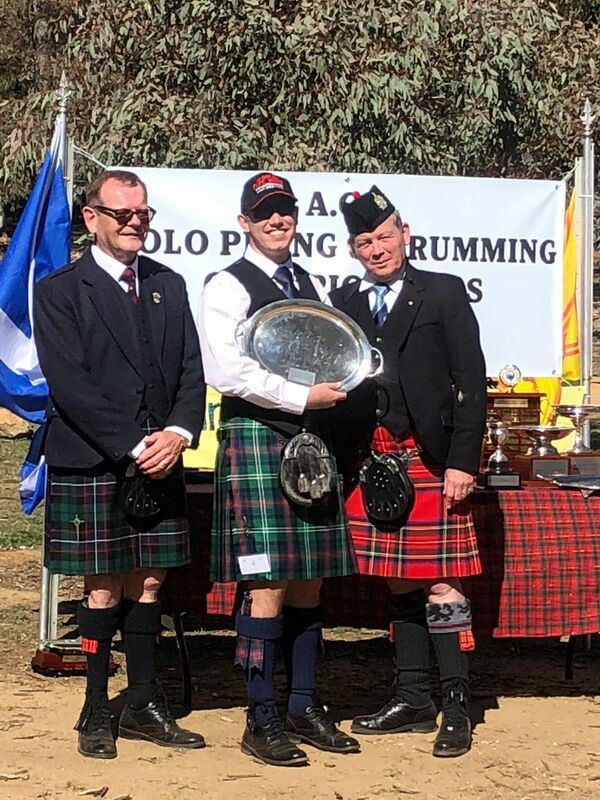 He gained a 2nd for C Grade 2/4 March and First for Stathspey and Reel. 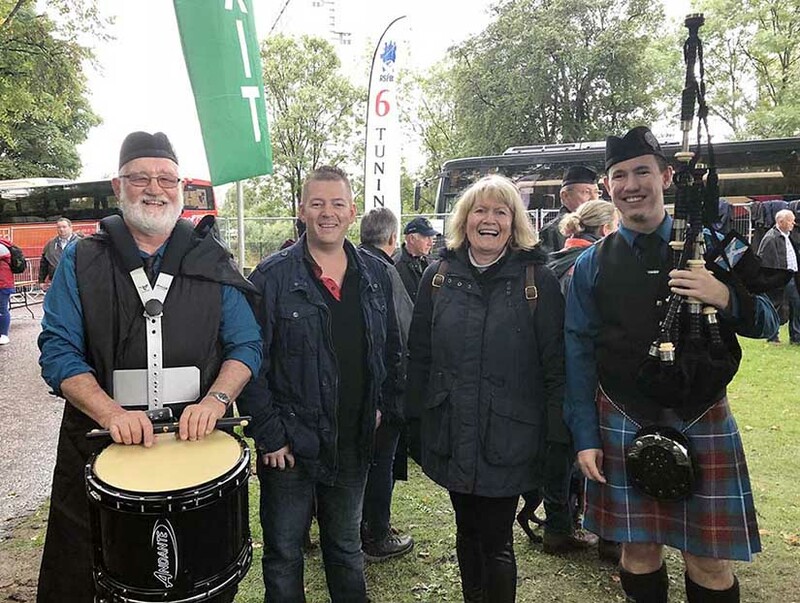 Graham Dixon, Brucey, Deborah Orr and Aaron Gray at the World Championships in Glasgow 2018. 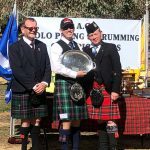 Both Aaron and Graham competed with Murrumba Pipes and Drums. 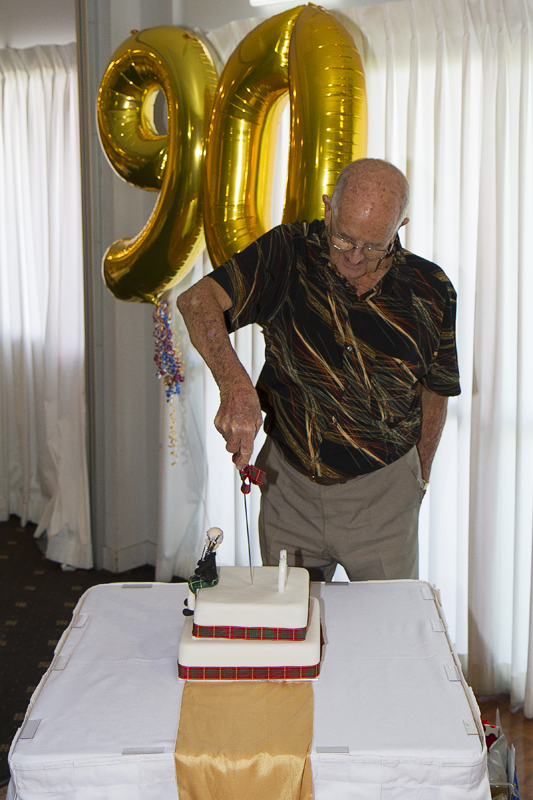 On March 10 band members attended a party at the North Mackay Bowls Club in honour of Alex Cameron who turned 90. Alex is our oldest piper and still an active member. Alex joined the Mackay and District Pipe Band in 1966 and has been a Pipe Major during that time, he is one of our piping teachers and does a wonderful job playing at funerals and festive events.